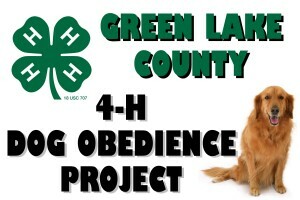 The Green Lake County 4-H Dog Obedience Training is held every year from April until the time of the fair at the fairgrounds. If you are interested in showing your dog at the fair, you need to attend Dog Obedience Training. Please call the 4-H Dog Project Leaders below to find out dates and times of the Registration Meeting and Training Class dates/times etc.